Why does a doctor need to know English? The reasons why this language could be useful for those professionals are: 1) It is helpful for medical or scientific research, 2) for understanding manuals of equipments and instruments which can be found in hospitals and/or health centers, 3) for the use of computers or computer programs related to the management of patients’ personals details, and also 4) for the interaction with foreign patients. On the one hand, the first which comes to our mind is that health professionals need to know English if what they want is doing a medical research. That makes easier the access to all kinds of bibliographic material, since most of the publications from the area of medicine and nursing are written in English. On the other hand, if a doctor or a scientific wants to be up to date with latest studies, he or she must go to conferences frequently. Professionals know that the most important and interesting seminars are in English, even though the lecturer’s language is another different, probably the simultaneous translation will be in English. So that, all people knowing this language will have the advantage of understanding the message directly, without the risk of information loss. Finally, it is also important taking into account the interaction doctors have with foreign patients who live or are visiting Spain. We cannot forget that our country is a very tourist one; thousands of foreigners from around the world come to visit us every year, and most of the time their medium of communication is English. Even if these people come from other countries they are able to communicate in this language. So that, we could declare that for a health professional knowing English cannot be considered a luxury, but an obvious necessity. Noticia muy relevante para el Área de Idiomas. 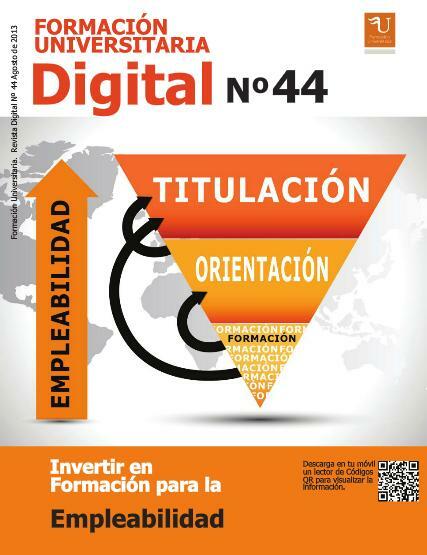 El último número de la revista Formación Universitaria Digital ya se encuentra disponible. En esta ocasión, muestra las claves para afrontarse con éxito a los nuevos retos que el mundo laboral presenta. La Formación es la base no sólo para la inserción de los nuevos profesionales sino para todos aquellos nuevos emprendedores y personas empleadas que quieran tener una proyección en el actual mercado laboral. Invertir en Formación es Invertir en Empleabilidad.